This vehicle delivers the equipment and features of Argo’s Wilderness together with maximum space for cargo and gear. 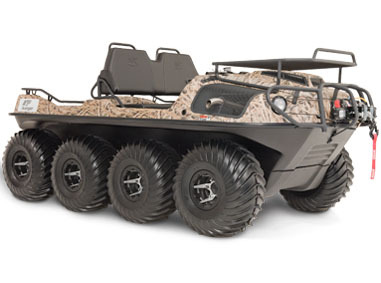 By itself, this XTV can carry up to 910 lbs., seats 6 passengers, and has a front cargo rack and a gun rack to carry extra equipment and up to four rifles. If more space is needed, it can pull a trailer weighing up to 1,800 lbs. Aluminum beadlock rims allow low tire pressures for covering rocky terrain, while a 3,500 lb. Warn winch can pull the vehicle out of jams. A brushguard protects the front end from branches and other hazards. The Huntmaster R is available in Mossy Oak’s Break-Up Country or Shadow Grass Blades camo patterns.